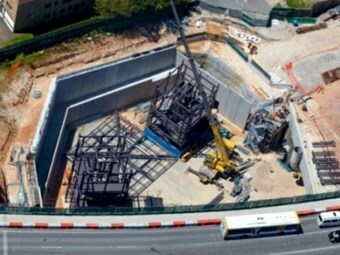 The steel framework for Brisbane’s Northern Busway Lutwyche station was being erected this week, creating a public transport landmark due to open in 2012. The bus station’s four towers will be 15 metres high weighing about 46 tonnes each, and include glass lifts over-looking nearby Bradshaw Park – and fully illuminated at night. Local member and former Infrastructure Minister Stirling Hinchliffe says the Lutwyche Busway Station will include an underpass allowing pedestrians and cyclists to access inbound and outbound platforms without crossing busy Lutwyche Road. "This is good news for locals wanting a fast trip to and from the city and Chermside as it will cut travel times." Thiess John Holland Project Director Gordon Ralph says the busway will go underground between Truro Street and Norman Avenue at Lutwyche, and between Stafford Road and Sadlier Street at Kedron, with access into the two new architecturally designed busway stations at Lutwyche and Kedron. "Tunnelling for the busway is almost complete and we have used a combination of driven tunnelling and cut and cover construction techniques," Ralph says. "Two roadheaders have finished excavation of the 490 metre section of mined busway tunnel and the cut-and-cover structures are nearing completion with the mechanical and electrical fit-out underway. " Ralph says engineers are still building parts of the cut-and-cover structures along Gympie Road. "This involves piling to create the tunnel walls, excavation to the tunnel roof level, installation of concrete beams to form the roof, back filling over the newly constructed roof and then excavation under the roof slab to form the tunnel." Acting Premier Paul Lucas says the 3km Windsor to Kedron section of the Northern Busway will include 1.5 kilometres of tunnel, two state-of-the-art bus stations at Lutwyche and Kedron Brook and eight new bus shelters for north Brisbane residents. "Currently the steel framework for the station's towers is being installed, which will be followed by their glass exterior and by the middle of this year the final design will be complete. BrisConnections CEO Dr Ray Wilson says the project was on schedule: "By 2016, the busway will have the ability to cater for 47,000 public transport trips per day – more than five times the current number." The Northern Busway is part of a proposed Brisbane public transport network, eventually spanning the city and combining the existing rail network. After construction is complete the Northern Busway will be handed to the Queensland Government for operation by TransLink. Prior to opening, TransLink network planners will review local services to maximise travel times and bus frequency on the new busway.